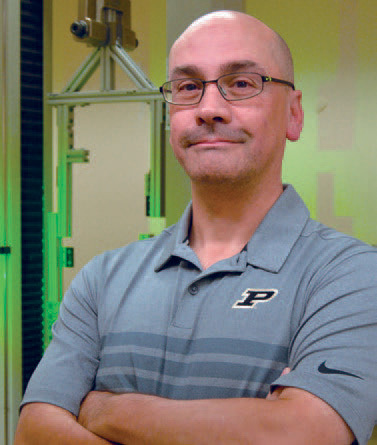 By infusing concrete with microscopic crystals made from wood cellulose, Purdue Professor Pablo Zavattieri, along with researchers from Purdue's School of Materials Engineering and Oregon State University, have shown they can make concrete stronger. This project, which started in 2011 with a National Science Foundation grant, is now moving from the laboratory to the real world with a bridge under construction in northern California this year. The researchers have been working with cellulose nanocrystals (CNCs), byproducts generated by the paper, bioenergy, agriculture and pulp industries, to find the best mixture to strengthen concrete, the most common man-made material in the world. Zavattieri says strengthening concrete has other implications, such as making concrete items thinner and lighter. Another potential benefit is sustainable concrete production. Using less concrete means using less cement, which in turn means less carbon dioxide released into the atmosphere. Cement plants account for about 8 percent of global emissions of carbon dioxide, which is one of the main causes of climate change. The catalyst for this potentially transformative change is a cellulose nanocrystal about 100 nanometers long and 5 nanometers wide, so small that it can be seen only using an electron microscope. (For perspective, a human hair is about 100,000 nanometers wide.) Yet cellulose is the most common polymer in the world because it can be obtained from wood products, plants, bacteria and algae. Zavattieri says that the cellulose nanocrystals provide an avenue for the water to be distributed in the mix. In traditional production, not all cement particles are hydrated when concrete is mixed, which hampers the strength and durability of the concrete. "The good thing about cellulose nanocrystals is that they create a kind of rail for the water to 'ride' into a particle," Zavattieri says. Jason Weiss, the Miles Lowell and Margaret Watt Edwards Distinguished Chair in Engineering at Oregon State, who previously was a Purdue civil engineering professor, says the cellulose nanocrystals make concrete more sustainable and more efficient because less mass is needed to make something that is equally strong. The research team reported that earlier NSF-funded work in CNCs led to the discovery that cellulose nanocrystals are not acting like conventional fibers but rather are altering the microstructure of the material. The researchers say the cost of using the cellulose nanocrystals may be offset by being able to use less cement, although the exact cost of the new material hasn't been determined. Nevertheless, even if only a small percentage of all the concrete produced used cellulose nanocrystals, it would have a big impact just because concrete use is so ubiquitous.